Pocket watch with Victorian paintings on casings and cover (inside and out). Possibly a bicentennial model. I am not sure and I cannot open the back. The year is a guess. Welcome to myBulova! What a lovely watch and in the original box. If you could open the watch and take a photo of the movement take would be helpful. If you do not want to do it yourself most jewelers are happy to do it and let you take a photo. Based on the box I think the late 60's or newer is a good guess. This is an interesting piece, I don't think I've seen one like it before. I wonder if it's a Bulova Centennial model. I think Bulova celebrated 100 years in 1975. I'm with Geoff, never seen one before and assume it's likely a 1975. I would almost be inclined to go with the box and tag it a Bulova "One Hundred". A picture of the movement would be helpful. Hello! That's pretty much what I was thinking. I can't open the back and the person I brought it to couldn't either, although I will be checking in with another local business this week to see! Is it just me or is the inside cover picture a bit risque? Thinking I've seen something similar if not the same...the pocket watch that is. Not sure whether to put it as a Bulova Pocket Watch "One Hundred", or make a new model called "One Hundred". Listing updated to 1975 which would co-incide with one hundred years for Bulova. Hmmm, gues I wasn't looking THAT close at the images! It is risqué isn't it! The picture on the front is bit naughty also. 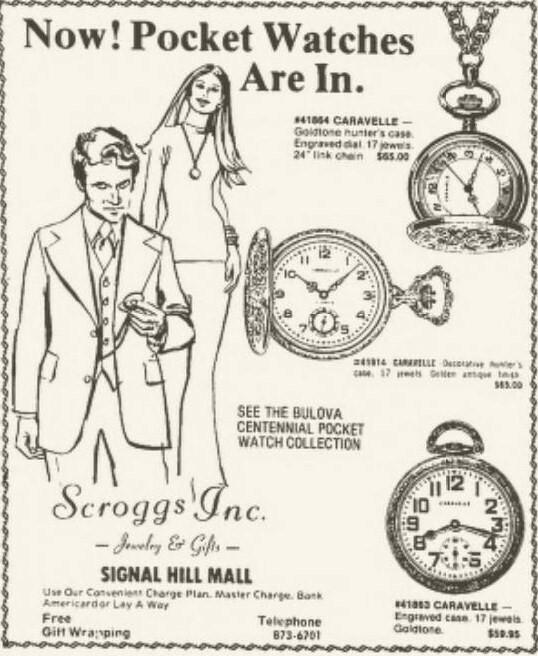 I guess that was popular with pocket watches. It's quite interesting! Ah just found this. Watches shown are Caravelle's. Another, but bicentennial. 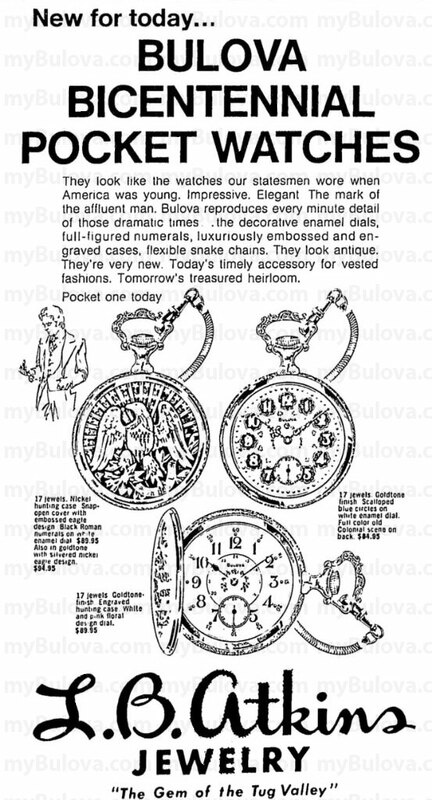 I guess showing what pocket watches looked like 200 years ago.